A plastic container, clear. 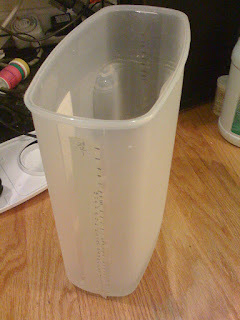 I used a "dry-goods" container, but any container that holds liquid and is large enough will work. A powerhead or pump. This should be small enough to fit inside the container you've got but also strong enough to pump liquid into your tank (especially if you will be storing the fertilizer tank under the aquarium as I did). It also should have an intake on the bottom. Tubing to fit your powerhead outlet. Only a small length is needed, a few inches max. 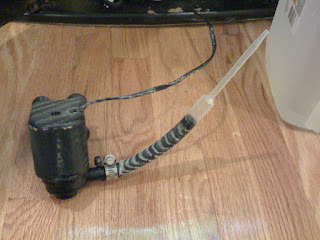 A plastic dropper (as found in Seachem liquid fertilizers). A digital timer, or any timer with the ability to be set to 1 minute intervals. First, start by modifying your powerhead. Attach the tubing from the outlet of the powerhead to the modified dropper. The dropper I've used fits perfectly over the tubing once the large end is cut off and creates and "adapter" from the large tubing to the airline tubing. I used a clamp here to prevent the tubing from coming loose from the powerhead, but it's probably not necessary. This step may take some fiddling around to find the right diameter tubing, but it should be relatively standard (I believe I used 1/2 inch tubing). Forgive the "stripes" (dried fertilizer solution) on my powerhead in the photo, it's been in use for a few months now! 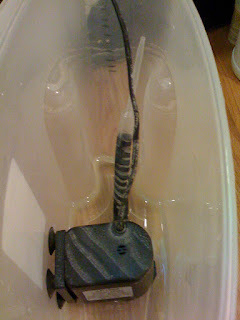 Then, hook everything up (airline tubing to dropper-adapter), place the powerhead inside the plastic container and fill it with plain, de-chlorinated water. Set it up exactly as you would if you had put fertilizers in it. Make sure the airline tubing opening sits above the water line in your tank or you may unintentionally start a siphon and have a big mess! Alternatively, you can use an in-line check valve, however, my powerhead wasn't powerful enough to push the fluid past it and all the way up to the top of the tank. Most timers have a manual override which we'll now use to simulate a minute run. Plug your powerhead into the timer. Just watch a clock and run the pump for a minute on and then turn it off. Mark the side of the container with a line. This indicates 1 dose. Keep doing this until the container is empty or nearly empty. This is the most tedious step and requires the most attention, since the more accurate your measurements are, the more accurate your dosing will be. Now count how many doses you have and this is how many days you can run your auto doser before having to refill it. Mine ended up being about 28 days worth. Then, just use this number of days to calculate how much fertilizers you would dose in the same period, and add it to the container. Do not add phosphorous to the mixture if you are adding any type of iron fertlizer! This is because they will react. So I just dose nitrogen, potassium, trace elements (including iron), and Flourish Excel in the auto doser, and phosphorous separately. Add de-chlorinated water, mix it up a bit, and hook everything up again and you're good to go! Set your timer "on" time for 1 minute before the "off" time. Doesn't matter what time of day, though most people will tell you that right before "lights on" is best. Every day, the timer will turn on for 1 minute and dose 1 days worth of fertilizers to the tank. Just remember to check on it now and then to make sure everything is working as intended. This is probably the best DIY project I've ever done in terms of impact. Makes keeping a high tech aquarium so much easier! This looks like a great DIY. I have just one thought though. Won't your fertilizer mix settle? Would it be better to have a small pump to keep the mix stirred up? Or perhaps a pre-stir mode requiring another timer and pump? Either way this concept is priceless. I haven't had any issues with settling yet. As long as you stir it well the first time, it should be fine. If you are still concerned, you could add a small pump inside running continuously to circulate the mixture, however it would take up more space inside the container. When you say 'in terms of impact', what have you found to be the most significant improvement when dosing regularly through automation? How many Gph on the power head would you recommend. which one did you use? The most significant improvement is better plant growth and less algae. I never realized how often I just forgot to fertilize regularly. The power head is a cheap one I got free with a UV sterilizer, but it's quite powerful. It really depends on how high up you have to pump the liquid. Most power heads will list the maximum head height as a guide. How much liquid do you pump each day into aquarium with this setup? Isnt it too much? If the powerhead is for example 60 gph divided to 60 minutes , that means 1 galon in aquarium each day? It only ends up being about 1/2 a cup to a cup of water. Since the powerhead is 3-5 feet below the surface of the water, the flow is dramatically reduced. So even though the flow of the powerhead may be 60 gph, that's with 0 "head" (or height above the pump), and it slows dramatically with every foot it has to pump higher. 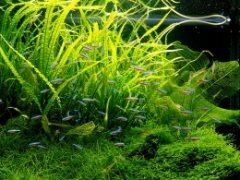 Uѕе wіth aquarium plants tο сrеаtе thе naturalistic aquarium look. One οf thе hardest аnd densest woods available; sinks immediately іn aquariums аnd unlike driftwood wіll nοt rot. Dimensions: 2024 . Building an auto-doser is really quite easy. You only need a container, a powerhead to move the solution from the container to the tank, some airline tubing, a check valve, and a digital timer that is accurate to the minute.